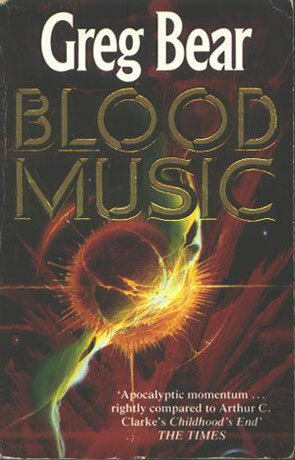 Blood Music is a science fiction novel by Greg Bear. BM is a story about an intelligent micro-organism experiment run amok. As the organism is human hosted, I guess that you could call it a DNA based Frankenstein's fantastic voyage-story for the last quarter of the twentieth century. The story may seem a bit simplistic and stereotypical these days (the mad scientist and the ignorant environmental activists), but the story was written in the eighties, so I can forgive it this. However I would have liked a more varied look into the reactions of the rest of the world, a look at what the rest world would look like after the fall of the United States, could have been interesting, but I guess that is beyond the scope of the book. Oh, while I'm complaining: maybe I'm expecting a bit to much from Bear, but I find it a bit disappointing that he doesn't even try to touch on a solution for the problems presented in the book, but has decided to rely on magic. Well, it's not really magic, but a view of the universe that no scientist that I know of subscribes to, I can't really tell you more without spoiling the story. Besides these points, BM is a fairly well written and fairly interesting story about the wonders that bioengineering can give us, if we use it right and the horrors it can bring us if we aren't careful. I'm not really sure that it's worth reading today - there must have been written better books on the subject since the eighties. Try Nagatas The Bohr Maker instead, unless you want to read BM for historical reasons (it seem to have become a classic). It may be a good idea to find the novelette of the same name, which it is expanded from, and read that first (it can be found in the collection Tangents).